When it comes to American cheese, everyone, it seems, has an opinion. At once it is an unhealthy Frankenfood, and another example of greedy food companies poisoning our once-pure diets, but, politics and health be damned, it's also simply the best ever to melt on a burger. Haters tend to hate in volume and quantity, loudly and lengthily explaining all the nuanced evils of the fake, imposter cheese. But us lovers, well, we're usually too busy enjoying nachos and grilled cheese sandwiches to be bothered by naysayers. And that right there is where I step in. I believe American cheese is not only fascinating but also a delicious, even essential part of all sorts of meals. It deserves a proper defense, and so today, a proper defense is what it will get. First off, in the world of cheese-like products, not all contain real cheese. But as far as American cheese and the larger category of processed cheese it belongs to are concerned, it's all legally required to be made from real cheese. Is it made solely of cheese? Nope. 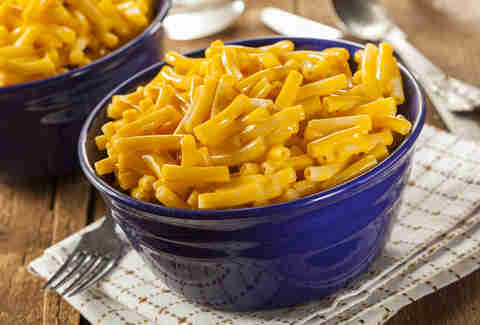 Just like the cheesy béchamel sauce you pour over your macaroni or the bubbling pot of fondue you brought back from your time-traveling trip to the 1970s, processed cheese is a product made from real cheese followed by a few other ingredients, most of which help said cheese melt more smoothly. Fondue is actually where processed cheese originates. The key component of fondue is tart white wine, because it (the wine) contains various acids that weaken the casein protein matrix of cheese and help it melt without splitting into clumps of protein and puddles of fat. But if you don’t feel like cracking open a bottle of wine every time you want cheese to melt effectively, you can instead add the more convenient sodium version of one of those acids, sodium citrate. Which is exactly what a smart Swiss cheese fan did back in 1911 when he created the first processed cheese. Kraft -- the guy, not the brand -- jumped on board a few years later and was the first to patent processed cheese using his own blend of sodium citrate-like things (collectively referred to as melting salts). 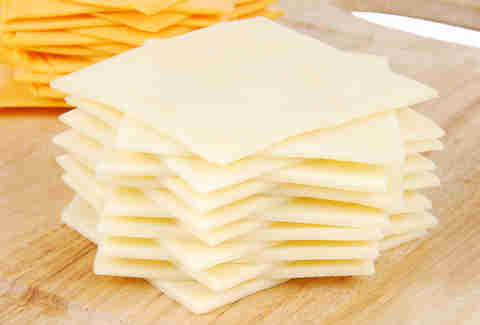 Since then, processed cheese has been a way for cheese manufacturers to make good use of scrap cheese. Think of it as nose-to-tail cheesemaking, the paté of the cheese world if you will. American cheese is legally required to be made from real cheese. Eventually, though, food companies realized that rather than adding melting salts to make stubborn cheese flow more smoothly, they could bypass the cheese part and build the perfect cheese-like substance more efficiently from scratch. 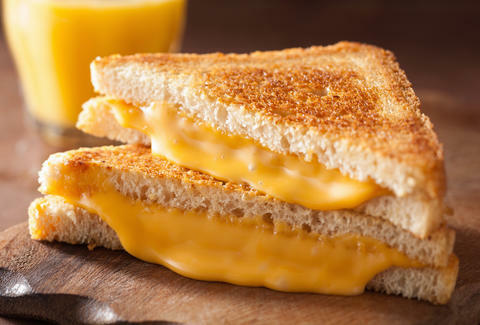 Processed cheese product or processed cheese food (not to be confused with simple processed cheese) was born. So it's true that processed cheese food/product does not contain any actual cheese, only dairy and “cheese ingredients.” Basically, processed cheese food was invented to mimic the real thing without bothering to first be that real thing. I think the stuff is interesting. That said, if you’re concerned about your melty cheese containing actual, real cheese, simply read the ingredients. If it lists any kind of cheese, then you’re good to go. If it’s a long list of milk, protein, and emulsifiers, then you’re looking at a cheese-free processed cheese product. But just so you know, American cheese is legally required to be made from real cheese. As for the health implications of American cheese, let me first say that I’m about as qualified to discuss this as practically every other person on the internet with an opinion. That is to say, I am completely unqualified. But I have no intention of letting that stop me. Processed cheese is cheese with some stuff added, processed cheese food/product is dairy and protein with stuff added. Either way, they’re not any less healthy than regular cheese. Yes, there are words on the ingredient list you don’t understand, but that doesn’t necessarily make them bad, it just makes you not a chemist. Plus, all "all-natural" foods are composed of a series of organic compounds you can't pronounce, anyway. And let’s not forget that "real" cheese is made by the highly scientific process of manipulating milk proteins with acidifying chemicals found, amongst other places, in the stomachs of cows. Have you seen actual cheese being made? It’s sterile and precise. It’s essentially a laboratory. (A delicious laboratory, but a laboratory nonetheless.) "Real" cheese is just as much a science project as processed cheese, but no one automatically assumes it's unhealthy in the same way. The only thing unhealthy about processed cheese is the amount of it you choose to consume. But that’s true for anything. Hell, you can kill yourself by drinking too much water. A few gooey slices of cheese product here and there aren’t going to derail your diet. Sometimes adding texture without complicating flavor is the right move. Now, when it comes to flavor, or lack thereof, the argument is often that processed cheese doesn’t taste like much, especially when compared to traditionally made cheeses. My counter is: that’s exactly the point! Here's an analogy from my day-to-day as a bartender: a Tom Collins is essentially a gin sour with added soda water. Soda water brings texture to the drink, not flavor. It actually dilutes the flavors already present. If more flavor was always preferable, wouldn’t a Tom Collins be improved if the soda water wasn’t added to begin with, or was replaced with something stronger-tasting, like Mountain Dew? The answer, luckily for everyone that sits at my bar, is no. Sometimes adding texture without complicating flavor is the right move. In the same way, American cheese is the food equivalent of soda water. It adds texture to some dishes without covering up or muddying existing flavors. For example, I recently ate a perfectly good burger that was ruined by a big slice of Brie. The earthy, intensely flavored cheese that I love so much in small bites on crackers overwhelmed the already-decadent burger. The end result was a burger that was less than the sum of its parts, heavy-handed, and kinda gross. What it needed instead was the great melty texture that Brie provides, without the dominating flavor. It needed American cheese. That's not to say American cheese can appropriately be comparable to, say, Gorgonzola. They're different, and different is good. The best thing to do is to embrace the widest variety of foods available and eat what's appropriate for the occasion. Sometimes you want an aged cheddar with those fantastic crunchy crystals in it with a glass of wine before dinner, sometimes you want a Philly cheesesteak donut. Delicious, thankfully, is a moving target. If, after all that, you are still upset that store-bought processed cheese doesn’t have enough flavor, then go and make your own from a tastier cheese. I do this all the time. Simply combine your favorite cheese(s), some water, milk, or beer, and our good friend sodium citrate, and you’ve got homemade processed cheese. Modernist Cuisine and ChefSteps have recipes for this. Don’t want to buy sodium citrate? Then follow these (admittedly more difficult) recipes from Serious Eats and the LA Times. We’re in the midst of a renaissance of high-quality cheesemaking all across the United States. But just because so much cheese in America really is great, that doesn’t mean you shouldn’t also save some room in your refrigerator for good old American cheese. It more than deserves a spot there, too. After earning a bachelor's in English, Brett Adams spent his 20s touring in a punk-rock band before then settling down in Portland, OR to pursue a career in food service and other cliches. He is available occasionally on Twitter at @adamscommabrett and regularly behind the bar at the Multnomah Whiskey Library.